I catered a birthday party a couple of years ago and the theme of the party was Old Hollywood. I can’t take the credit for the idea but I really liked working around the theme. You may be able to see the old Hollywood star pictures I copied, matted and put around the food trays. All the guests arrived in long dresses, many had Hepburn hairstyles. The party was a surprise so when they limo pulled up to the red carpet at the front door, all the guest were outside applauding (just like at the Oscar’s). Fun, fun party with lots of champagne and wonderful food. This is one of the dishes I did for the party. 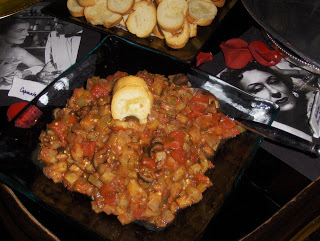 The Caponata I served on toasted baguette slices but I have also used this recipe on top of pasta. Spicy mixture of eggplant, tomatoes, onions and olives. Delicious spread on toasted baguettes. Peel and cube the eggplant. Saute the celery and onion in small amount of olive oil. Add the eggplant and saute until it starts to cook. Add remaining ingredients except for toasted bread rounds and simmer for 45 minutes. Serve warm or at room temperature with toasted bread rounds.This can also be served with pasta.